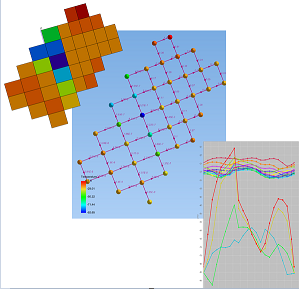 Ability to parameterise a model by defining variables and referencing the variables within definitions, such as geometry and boundary conditions. Ability to visualise the network representation of a thermal model is an excellent way to assess the connectivity of a model and visualise heat flows, simplifying model verification and helping to understand predicted results. Support for post-processing of fluid data using charts, including the schematic representation of the fluid network. ESATAN-TMS contains a unique algorithm to derive equivalent lumped parameter conductances for thermal contact between arbitrary domains. This algorithm has been generalised further to allow the lumped parameter conductances to be calculated between faces merged together that span multiple geometric shell primitives. Ability to export the data for multiple charts within a model from a single export, without the need to select and export the charts one-by-one. The export formats supported include exporting an image of the chart as a PNG file, and exporting the data series on the chart to a CSV file. Additional control of points displayed within the visualisation has been added through the Display option dialogue. Simplification of the definition of the sink temperature by allowing the environment to be defined as the complete model, with the nodes defined in the first group automatically excluded from the environment. Extension of Workbench to display in the analysis case subfolders showing the related Boundary Conditions, User Defined Conductors, Contact Zones and referenced Charts. Displaying the subfolders makes it very easy to see and report on relationships. Extension of the attribute chart to allow a secondary ordinate axis to be specified, and attributes to be defined with respect to the primary or secondary axis.